At his parents’ home in Santa Clara, Marco Cuhen holds a photo of his son Marco, who was 5 months old when he came into contact with a space heater and burned to death in 2003. Cuhen and Marco’s mother Kimberly Chavez were sentenced to 10 years in prison each for child abandonment resulting in death. Marco Cuhen stands at the Santa Clara grave of his son, Marco, who burned to death after coming into contact with a space heater in 2003. Cuhen, fresh out of prison for his role in his son’s death, said he stops by the grave regularly. Trinkets and flowers decorate the Santa Clara grave of 5-month-old Marco Cuhen, who came into contact with a space heater and burned to death in 2003. His parents both spent time in prison for his death. SANTA CLARA – Grief clogs Michael Cuhen’s words, turning sentences into broken rambles. It is an anguish that’s felt more than heard, the grief of a parent whose child is dead. Cuhen stumbles through his story on a ride to downtown Silver City with a reporter in March, the first time he’s been home since he got out of prison and one of the few times since his son Marco died in December 2003. It’s more difficult than he expected. The grief is overwhelming now that he’s back where it happened. “All it boils down to is, I miss my son,” he says. Marco was one of at least 14 children in Doña Ana, Luna and Grant counties who died of abuse or neglect from 2001 to 2013. A review of hundreds of pages of police reports, prison records, autopsy findings and news reports by New Mexico In Depth and the Las Cruces Sun-News suggests many of those child abuse and neglect cases followed a similar storyline: Children did not meet their caregivers’ expectations because the caregivers did not understand their behavior. Marco’s death is an example of what experts say can happen when caretakers don’t understand child behavior and development. Cuhen is small and thin. A black cap hangs low over his face, nearly obscuring his sad, dark brown eyes. They are largely expressionless as he recounts, his voice wavering, how he found five-month-old Marco dead on a cold morning in December 2003. Cuhen put Marco to sleep 10 hours earlier on a bed without rails, near a space heater for warmth. He surrounded the boy with pillows. Cuhen and Marco’s mother, Kimberly Chavez, smoked marijuana and fell asleep on the couch. Sometime during the night, Marco came into contact with the space heater and burned to death. Marco’s short-sleeved white and blue onesie and long-sleeved light yellow jumper were charred and melted in places, according to his autopsy report. Severe burns streaked parts of his face, head, chest and abdomen, blackening the skin. The burn on his right pinkie finger was so deep it exposed the bone. New Mexico has been among the eight states with the highest number of per-capita child abuse and neglect deaths for four of the past five years, according to the U.S. Children’s Bureau. In 2010 and 2008, New Mexico recorded the second and third highest rate of deaths in the country, respectively, with 19 children dying from abuse and neglect in each of those years. The state also performs poorly on a national, comprehensive evaluation of child well-being, called Kids Count, ranking 49th or 50th for the past three years. There’s no simple solution for addressing the complex factors that lead to child abuse. But every expert interviewed for this article supported expanding home visiting programs to better educate parents and help prevent child abuse and neglect. Several home visiting programs funded by a patchwork of public and private funding exist in New Mexico, but experts say they fall far short of the need. There’s no simple solution for addressing the complex factors that lead to child abuse. But every expert interviewed for this article supported expanding home visiting programs to better educate parents and help prevent child abuse and neglect. Several home visiting programs funded by a patchwork of public and private funding exist in New Mexico, but experts say they fall far short of the need. How New Mexico should allot dollars for early childhood programs such as home visiting has divided policymakers in recent years. The debate will likely continue when state lawmakers meet in January for the 2015 legislative session. Home visiting works like this: Parents learn of the free, voluntary programs through doctors’ offices, hospitals, schools or word of mouth. Once enrolled, a nurse or early childhood education specialist visits the home of a pregnant mom or parent of a newborn for an hour each week, usually through the child’s third birthday. Home visitors work from a set curriculum. They urge pregnant women to stop smoking, drinking and doing drugs. They remind parents to take deep breaths or walk away when they’re frustrated with their children. They help families enroll in Medicaid or food stamps. They teach parents about the dangers of shaking a baby. They explain child development, helping parents understand, for example, that children who wet their pants or cry inconsolably don’t mean to be aggravating. In Anthony, Jessica Barron abused her 5-year-old daughter, Angel Lorraine Jimenez, over a period of four days in 2010, according to sheriff’s reports. After the girl’s death, a younger sibling told investigators Barron beat Angel with a stick until “she fell asleep,” apparently because the kindergartener soiled her pants. Elisa Bravo dressed her young children in fancy clothes. She expected them to sit quietly and stay clean, like dolls. If they disobeyed, she spanked them harshly. One day in July 2001, Bravo slammed her 4-year-old son Rodrigo’s head against the wall in their home on Las Cruces’ East Mesa, according to case records. He died five days later. Fatal child abuse is linked to family income, stress, mental and behavioral health, substance abuse and child-care availability. There is no cure-all, but experts say home visiting could help prevent violence against a child when a caregiver is stressed or doesn’t understand the child’s behavior. “You educate the parent and you hopefully lower the chance that that baby’s going to be abused,” said Allen Sánchez, president and CEO of nonprofit Catholic Health Initiatives St. Joseph’s Children, which offers home visiting. St. Joseph’s free home visiting program serves 500 families in Sandoval, Valencia and Bernalillo counties. It operates on donations and interest from the sale of the former St. Joseph Healthcare System in Albuquerque. Los Alamos National Laboratory Foundation’s free First Born Program serves more than 1,000 families in 15 counties. It’s launching a program in Doña Ana County. State and private dollars fund the initiatives. The New Mexico Children, Youth and Families Department also runs some home visiting sites. And CYFD allocates about $10 million in state and federal funds to programs in 22 of the state’s 33 counties, including Doña Ana, Grant and Luna. Experts, however, say those programs fall far short of meeting the need. Legislators appropriated $2.5 million more for home visiting in the current fiscal year, a 30 percent increase in state funding, according to a Legislative Finance Committee (LFC) report. But that’s a drop in the ocean of what experts say is necessary to change the fate of New Mexico’s children. Legislators appropriated $2.5 million more for home visiting in the current fiscal year, a 30 percent increase in state funding, according to a Legislative Finance Committee report. But that’s a drop in the ocean of what experts say is necessary to change the fate of New Mexico’s children. “If every single family who had a baby could do home visits, it would change the face of the state,” First Born Program officer Anna Marie Garcia said. LFC estimates serving all eligible families statewide would require an additional $30.5 million annually. In part to help combat abuse, many advocates want to direct 1.5 percent of the state’s $14 billion Land Grant Permanent Fund toward early childhood education, including expanding home visiting programs. The proposal has gone nowhere in the Legislature in recent years despite a concerted lobbying effort and an Albuquerque Journal poll showing two-thirds of New Mexico voters support such a move. No U.S. state offers universal home visiting, said Jennifer Stapleton of Pew Charitable Trusts’ home visiting campaign. However, many states are implementing research-based programs and seeking financing outside of their general funds, which is New Mexico’s main source of state money for home visiting. Colorado, for example, spent $270 per low-income child on home visiting in fiscal year 2010, compared to New Mexico’s $64 per child. Much of Colorado’s $14.8 million in funding that year came from annual state tobacco settlement funds allocated to home visiting and a federal Medicaid match. Gov. Susana Martinez recently vetoed a $500,000 appropriation through Medicaid that would have leveraged an additional $1.1 million in federal matching funds for home visiting, according to LFC. CYFD has emphasized the need to dedicate stable funding streams to pay for the programs year-in, year out, rather than one-time tobacco funds or federal grants. That would best help New Mexico’s families and lower their risk of abusing or neglecting children, experts say. Every case NMID and the Sun-News examined had at least two of the risk factors. Most had three or more. Every child killed was 5 years old or younger. Half were younger than six months old. Police reports indicate many families struggled financially — sharing or going without a car, lacking reliable child care, living with parents or sharing a crowded mobile home with many people — possibly contributing to greater stress in the household. Many of the 19 convicted perpetrators had limited education. At least nine people convicted of killing their children never graduated from high school, though five eventually earned their General Educational Development equivalent in prison. 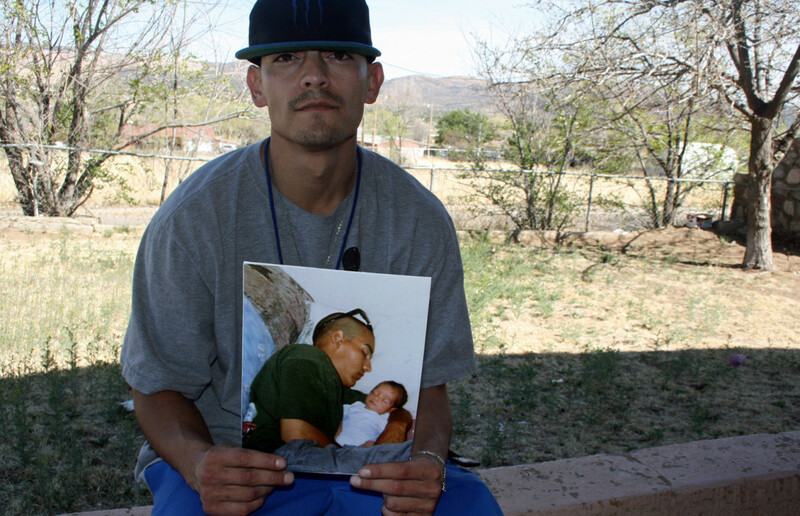 One father, Freddy Ordoñez, who killed his son and incinerated his body in 2004, only made it to eighth grade. The problem is complex, which means efforts to reduce deaths must be comprehensive, from tackling poverty, substance abuse, domestic violence and isolation to improving education and services for children with health and behavioral problems. Nearly two-thirds of the people convicted in the children’s deaths were men. Nearly half of the men were not the fathers of the children they killed — they were boyfriends or relatives. At least two biological fathers, Ordoñez and Andrew Walters, who was convicted of killing his 5-month-old daughter Brianna in 2002, questioned whether the children they killed were theirs. Marco Cuhen’s case has five of the eight factors: a young child, parents under 30, a low-income family, substance abuse and unrealistic expectations of child development. In other words, experts say the problem is complex, which means efforts to reduce deaths must be comprehensive, from tackling poverty, substance abuse, domestic violence and isolation to improving education and services for children with health and behavioral problems. “There’s no silver bullet for this, but there are longer-term type of investments that we want to make sure are in place,” said Gov. Martinez, who prosecuted several fatal child abuse and neglect deaths while Doña Ana County district attorney. Details from some of the cases of parents who killed their children illustrate the need for better parental education. Cuhen says he thought he was keeping Marco safe and warm when he left him on a bed without rails instead of in the bassinet. But babies begin to sit up and roll over around four months old, and pillows don’t always protect them. Cuhen was coming down from a meth high, he says. Unable to buy more, he and Chavez smoked marijuana after putting Marco to bed and watched “The Count of Monte Cristo,” his favorite movie. They fell asleep on the couch. He and Chavez left the baby boy alone for hours. There he found Marco’s body. Cuhen questions what happened the night Marco died. Maybe Chavez’s toddler son moved Marco closer to the space heater, thinking the baby was cold, Cuhen suggests. Or maybe Marco rolled over a pillow and into the heater. He and Chavez were each sentenced to 10 years in prison for Marco’s death. Chavez did not return a request for comment made through her family. Among the 14 deaths in southern New Mexico from 2001-2013, other parents’ choices were equally lethal, and in many cases more intentional. Martinez, in a recent phone interview, rattled off the names of convicted child killers from Doña Ana County who apparently shook a baby to quiet him or her: Eliasar Urrutia Quiñones, Michail Browning, Omar Valverde. Quiñones, now 44, confessed to squeezing his 5-week-old daughter Diana’s head and said he once heard a pop when lifting up her legs to change her diaper. He was convicted in her death and sentenced to 27 years in prison. Quiñones later said his admission was a lie, and he and his wife maintain his innocence. But Diana’s autopsy found fractured ribs, leg fractures and bleeding in her brain. Medical investigators ruled her death a homicide, and a jury agreed. In an interview at Western New Mexico Correctional Facility in Grants earlier this year, Quiñones recalled his wife’s difficult pregnancy. Diana was born prematurely. She was often fussy and needed oxygen and repeat trips to the hospital after her birth, he said. Children with health problems like Diana’s are often at greater risk of dying from abuse because they demand constant care from sometimes exhausted caregivers. In many of the cases NMID and the Sun-News reviewed, caregivers dropped or threw babies who wouldn’t stop crying. Prosecutors like Martinez can put child killers in jail, but advocates are looking to prevent abuse and neglect before they occur. Many areas in New Mexico lack home visiting programs, and many existing programs only accept first-time parents. Additional funding could make home visiting universal, advocates say. Martinez does not support taking money from the permanent fund. Her office called the fund “our children’s saving account” and said “robbing” it isn’t the answer. The governor said she wants to use existing money in the state budget to fund early childhood programs. She did not say what she would cut or how much additional funding she would seek. Other officials support taking 1.5 percent from the $14 billion permanent fund for early childhood education. Doing so would require approval from the state Legislature to allow a statewide, public vote on a proposed constitutional amendment. The governor’s signature is not required. The governor said she wants to use existing money in the state budget to fund early childhood programs. She did not say what she would cut or how much additional funding she would seek. Other officials support taking 1.5 percent from the $14 billion permanent fund for early childhood education. Doing so would require approval from the state Legislature to allow a statewide, public vote on a proposed constitutional amendment. The governor’s signature is not required. Senate Majority Leader Michael Sanchez, D-Belen, sponsored such a resolution earlier this year, but the proposal died without reaching the full Senate for a vote. Sen. Michael Padilla, D-Bernalillo, announced in September he would sponsor another attempt when the Legislature convenes in January. Whether the next attempt to fund such programs is successful, it’s too late for Rodrigo Bravo, Ameil Valverde, Brianna Lopez, Devon Boothe, Alondra Zizumbo, Sierra Browning, Uriah Vasquez Ordoñez, Diana Urrutia Quiñones, Kalynne Flores, Daniel Medina, Isaiah Lawrence Jimenez, Angel Lorraine Jimenez and Alizandra Jasso. And it’s too late for Marco Cuhen. Michael Cuhen says he couldn’t sleep for months after Marco died. Earlier this year, fresh out of prison for causing his son’s death, he said he learned prison was the easy part. Cuhen visits his son’s grave regularly, making sure rain and wind don’t mess up the statuettes of angels and a rattlesnake placed there for protection, or the crosses and bunches of colorful, fake flowers. Tiny toy ponies with teddy bear riders sit on the small dirt mound, surrounded by more dirt and dry desert grass. Cuhen straightens a small statue but mostly stands silently by the grave, his hands in his pockets, staring at the dirt.